Yes. Miami Vice, the show that ruled the air from '84 to '89, when I was a fresh-faced college student. 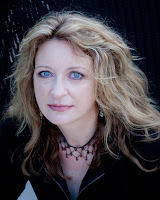 in 1984, I had an internship in Chapel Hill, NC, at IBM. I roomed with another intern named Michelle, and the two of us never missed an episode of Miami Vice. We sat on our rental couch and ate popcorn and focused all our attention on Crockett and Tubbs. In fact, the show is given credit for setting many of those devil-may-care trends, especially the fashions, now cringe-worthy, that represented the height of masculine style. From the wiki page - "They popularized, if not invented, the T-shirt under Armani jacket-style...Crockett's perpetually unshaven appearance sparked a minor fashion trend, ... 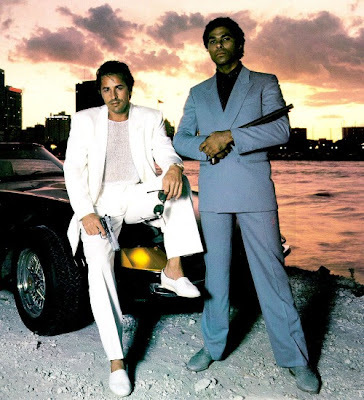 In an average episode, Crockett and Tubbs wore five to eight outfits, appearing in shades of pink, blue, green, peach, fuchsia..."
It's easy for today's young people (those in this house, for instance) to find the show laughable and unrealistic. In particular, the treatment of the "vice" for which it's named - the police division focusing primarily on drugs - has very little in common with what we now understand of the challenges posed by contemporary drug culture and politics. I guess you could say that Miami Vice is to contemporary drug trafficking and containment what aerobics instructor Barbie is to Jillian Michaels - frosting and froth with none of the depth levied by real-life challenges and circumstances. 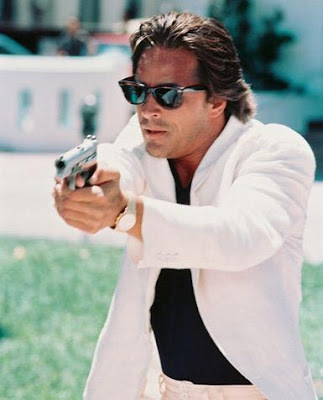 Still, Miami Vice was formative for me. Maybe it's just the glimmery glow of youth over which I'm rhapsodizing, but it may have been during that the kernel of a desire to tell crime stories emerged. And admit it, ladies of a certain age...Crockett kind of got to you, didn't he? A little? Oh, yes. And more than a little. How weird is it that I've never seen a single episode of "Miami Vice?" That was one of my TV-free periods, I guess. Then I again, I wasn't much at home with the sensibilities of the eighties. Maybe I just ignored a lot of stuff. Oh yes, Crockett did get to me. Miami Vice came along during the years when I watched a lot more tv than I do now. And I loved the show.